Perry Hill knows there are some things that can't be taught. Arm strength can't be taught, he told MLB.com in 2014. "But what you can teach," Hill told MLB.com, "is that [you] throw with your feet. You have to make the player's feet work correctly, and that adds to the carry on his arm. Maybe not the strength, but the ball carries [further] if you have good footwork with good mechanics." Hill spoke with experience. By that point, he'd had about a quarter century of experience as a coach and spent most of that time in the majors focusing on infielders. By 2014, he'd earned the title "infield guru," having worked with infielders across multiple organizations like Dee Gordon and Miguel Cabrera. His long career in baseball began in 1976, signed by the independent Rio Grande Valley WhiteWings. He played a season there, then moved to Mexico, where he played five seasons in the Sonora League. He turned coach by 1984, where he served at single-A Tri Cities. He joined the Rangers in 1987 as a roving instructor and coordinator. He stayed in that role through 1991. He got a card in 1990 with single-A Gastonia. In 1992, he made the jump to Texas as a big league coach. He stayed there through 1995. He then served as a coach with the Tigers from 1997 to 1999 and the Expos in 2000 and 2001. 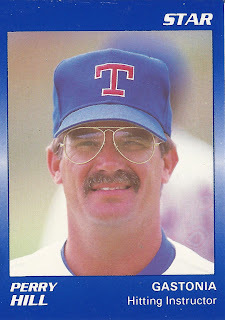 He frequently served as a base coach. He joined the Marlins in 2002 and stayed through 2007. In 2003, he helped coach the team to the World Series title. In one regular season game, Hill helped set up a run when the first base coach screamed for runner Alex Gonzalez to take off after a throw back to the mound got away. After spending time with the Pirates, Hill rejoined the Marlins in 2011. He continued with the team as first base coach in 2017. In 2014, The Boston Globe named Hill baseball's best infield instructor. "Generally regarded as the best infield guy, using metrics and other new-age methods to get what many consider the best results in baseball," The Globe wrote. Hill worked in 2015 with Marlins infielder Dee Gordon. After working with Hill, Gordon won a Gold Glove, The New York Times wrote. "That dude is just amazing; I can't say it enough," Gordon told The Times. "He's the best coach I've probably ever had." Boston Globe, Jan, 25, 2014: Who are the best coaches in baseball?